HSA 66 STIHL Lithium-Ion Hedge Trimmer. 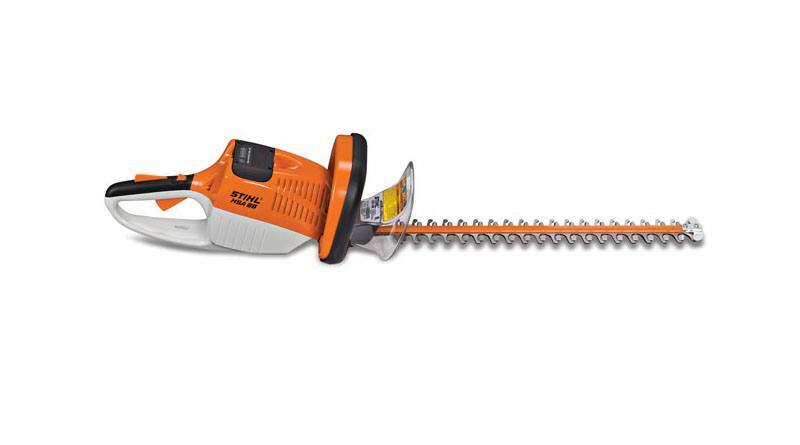 The STIHL HSA 66 Lithium-Ion hedge trimmer features a 36-volt lithium-ion battery and delivers strong, quiet cutting performance. Another tool in the STIHL Battery-Powered Equipment line, the HSA 66 runs on the same universal battery shared by all battery-powered tools. Its energy-efficient design allows for up to 40% longer run times when compared to the previous model. And as always, there’s no gradual drop in performance – it runs at full power until the battery is fully depleted. The HSA 66 is also a full pound lighter than the previous model, making it less fatiguing and easier to maneuver for landscaping professionals. And because there is no gasoline, no fuel cost, and no restrictive power cords, the HSA 66 delivers an excellent combination of performance and efficiency. The STIHL HSA 66 also has no exhaust emissions and is four times quieter than its gasoline-powered equivalent, making it an excellent alternative in environmentally sensitive areas.